Procter & Gamble has run a successful customer loyalty programme in Belgium, rewarding buyers with a free toy packed in a retro-look container from RPC Superfos. What looks like a mini cardboard pot containing washing powder is in fact an RPC Superfos plastic container from the Paintainer® range, with 150 building blocks from the Belgian company Clics Toys inside. The reward was offered to customers buying selected P&G products worth about 35 Euro. 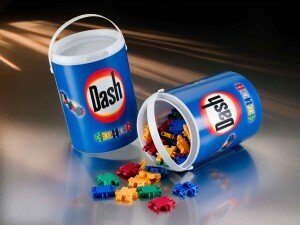 Both toys and packaging were thoroughly tested by P&G to make sure that all quality requirements were met. According to Jean Reusens, RPC Superfos and Clics Toys delivered impeccable quality and flawless production.